Sorry friends! 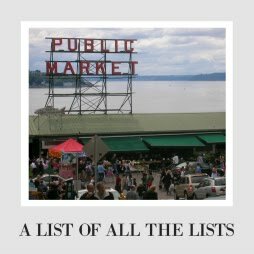 I know I went MIA for a little while there, but our family was traveling and then when we got back we had plenty to do just to get things back to normal and have our Seattle adventures! I missed writing, but we really loved some time to focus on the fam and have adventures. So important! I love the smell of a bonfire. It smells like summer. We had an awesome bonfire one of our first days home, and it really reminded me to appreciate that time together, because it just makes such a difference. It can be so hard to let go of the phone, or know this blog is sitting dormant as big news about plastic and the state of our planet comes out, but I have to follow my own advice and really be present in my own life as well. 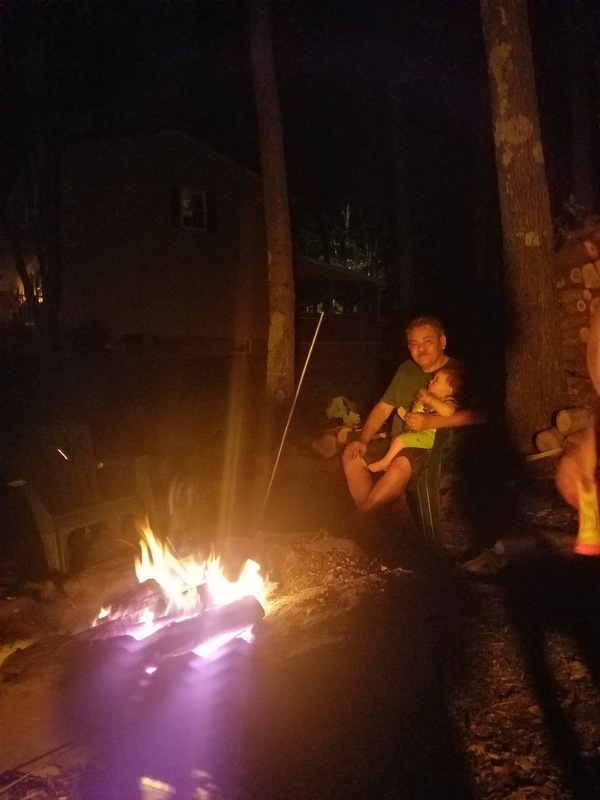 A toddler, a bonfire, and smores don't leave a hand to check my phone! We finally got a set of straws, and I think they are really great so far. My plan is to make a zero waste kit for my bags so when a plastic spoon is the only choice, we can leave it there and use what we have instead. It's such a simple thing to do, but I just haven't done it yet. Ready to make this positive change. Things at my Dad's house have definitely changed (and gotten much cuter), so I feel less like I can use my old space there as a holding area for stuff I may or may not find important later. So I sorted through a giant chest of old favorite toys that I was saving for a hypothetical daughter I am clearly not having. This chest had more toys in it than both of my boys have put together! 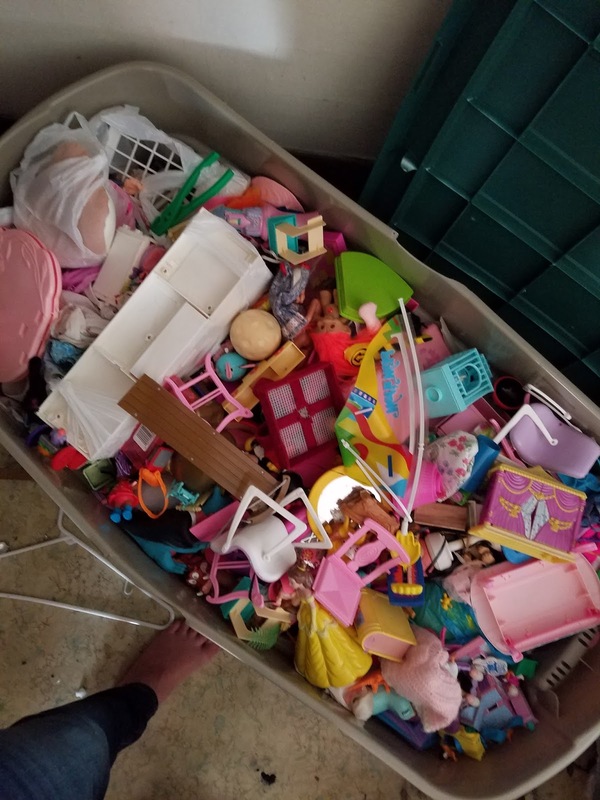 So I pulled out a few treasures for them and split the rest between friends' little girls and my sweet neice and still had plenty to take to Salvation Army. 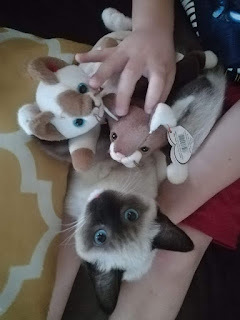 These are some old beanie babies snuggling with my friend's daughter's kitty. It makes me so happy to think those toys will get a second life and be loved by another kid instead of sitting in a chest somewhere collecting dust. I still believe it is worth it to save some special toys, but man I took it to another level. It feels good that I am making it right and making more room for my Dad's sweet new life. Our hometown does this cute thing where you can paint a rock, write "Franklin Rocks" on the back, and rehide the rocks. Come on. That is so damn cute and just goes to show it doesn't matter where you are, you can come up with something fun to do (without just buying stuff). Check your neighborhood- you might have one too! We spent a few days on the tail end of the trip up in Maine with my grandparents in their cabin. 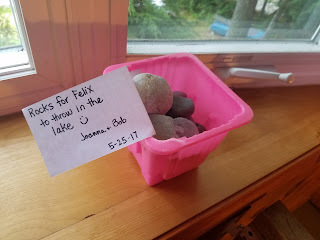 When we got there, there were two different pails of rocks for our toddler to throw in the lake- I just thought it was such a special and thoughtful thing to do. I love gifts, it will never stop being my love language, but now I can see that thoughtful gifts like these are the ones people remember most. First, she gets on the floor and plays. She isn't a spectator, she really plays. It's amazing how much more positive your interactions with kids are if you just give them something more fun to do than misbehave. Second, she talks to them like human beings and actually listens to what they say. Third, she has so much patience! She did the same puzzle with The Bub 30 times in 4 days. Even though he just kept sabotaging her. 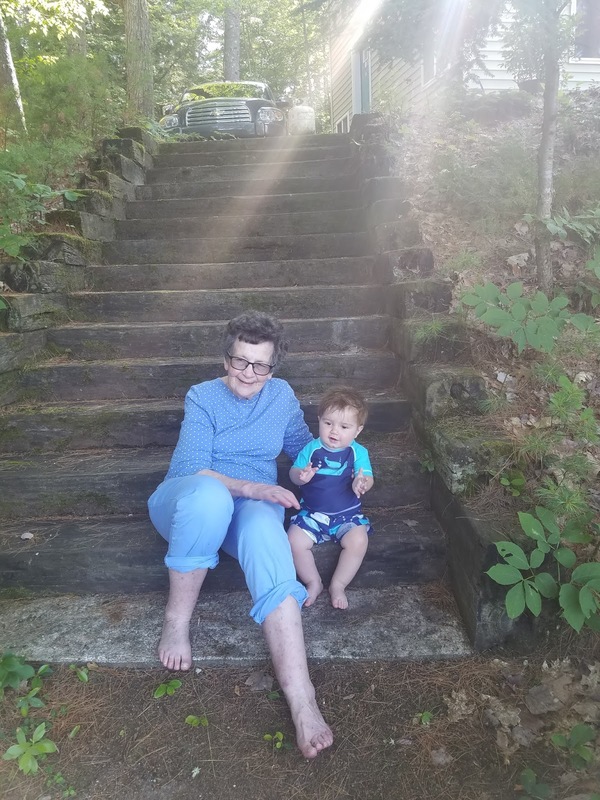 She is a big gifter, but the best thing about her is just being around her, and I think that is why her grandchildren are such a deeply devoted fan club. Spending the long weekend with her left me inspired to keep pushing myself to be present and to play. It makes a huge difference! We loved visiting the Portland Children's Museum as kids. There are 2 big things I remember- the firetruck you could drive and a cow that you could actually milk! We took our kids to visit the museum and it was just like I remembered (just smaller, go figure). 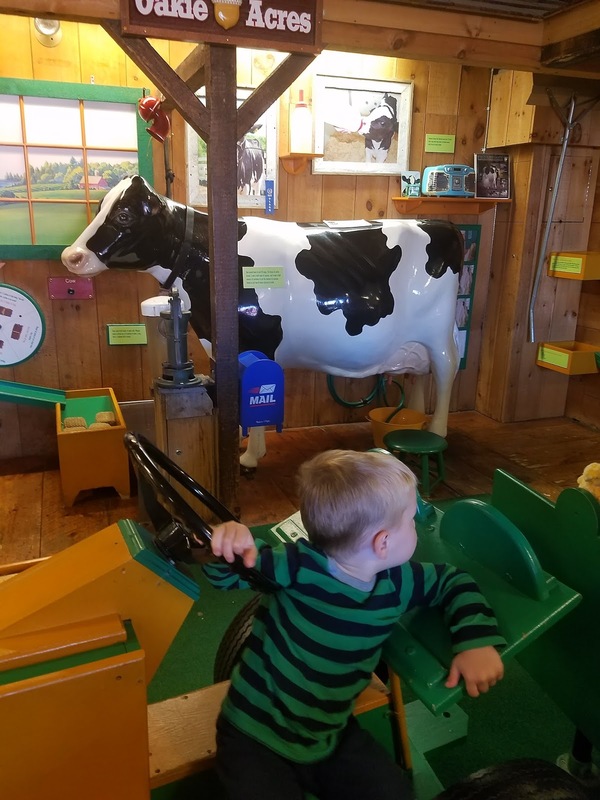 I was most excited that the cow is still holding on, delighting kids with her squishy udders. Also, The Bub loved feeding her lobster, mussels, and anything else my son could find. Anyway, I was just so tickled that they had taken such good care of that cow that she was still in use 20 years after I use it. I also feel for the first time like I am old enough to appreciate my grandparents and their commitment to using what still works. The cups, tools, everything in their cabin is pretty old because they just keep making them work instead of getting something new. I feel like this should be a goal for all of us. Don't replace it- if it still works, use it! Be like Maggie the milkable cow! 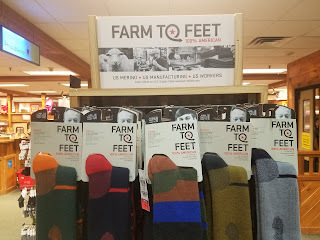 We walked around Kittery Trading Post, found some new Made in America stuff (Farm to Feet?) So cool. 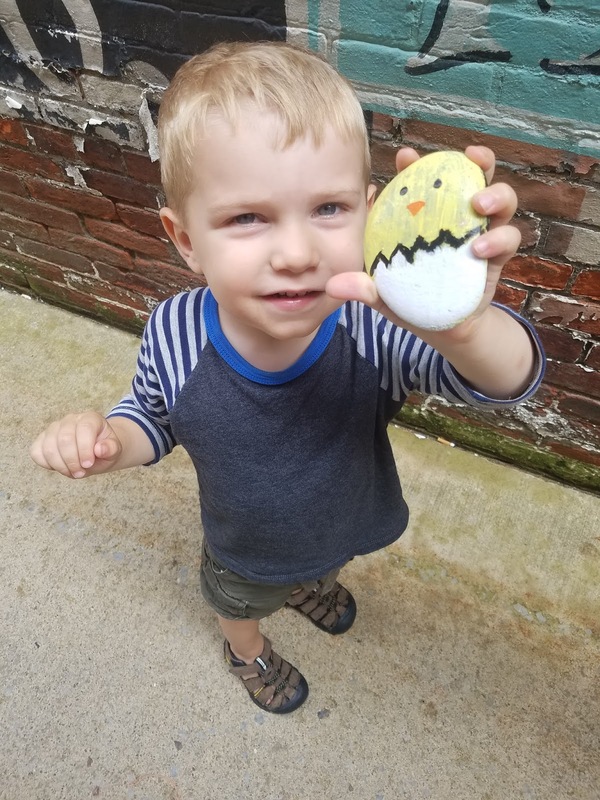 We didn't buy anything (why would I want a Maine Christmas ornament shipped from China? ), but we did find some new cool companies to check out. My shopping has really just turned into fact finding mission. Then we shared a lemonade and a lobster roll. Not shabby! I am excited that this week the White House is trying to highlight American-made products, including my beloved Liberty Bottleworks! I fight for Made in America because buying less and moving our stuff much shorter distances is epically important. 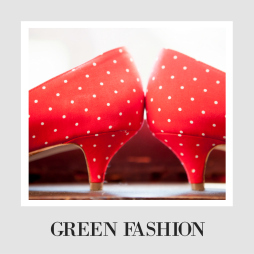 Made in America is seen as sweet or nostalgic, but it has real environmental impact, the more we all do it. Now, don't get me wrong. I think it takes deep and absolute hypocrisy to push American-made when your companies make literally nothing in America. 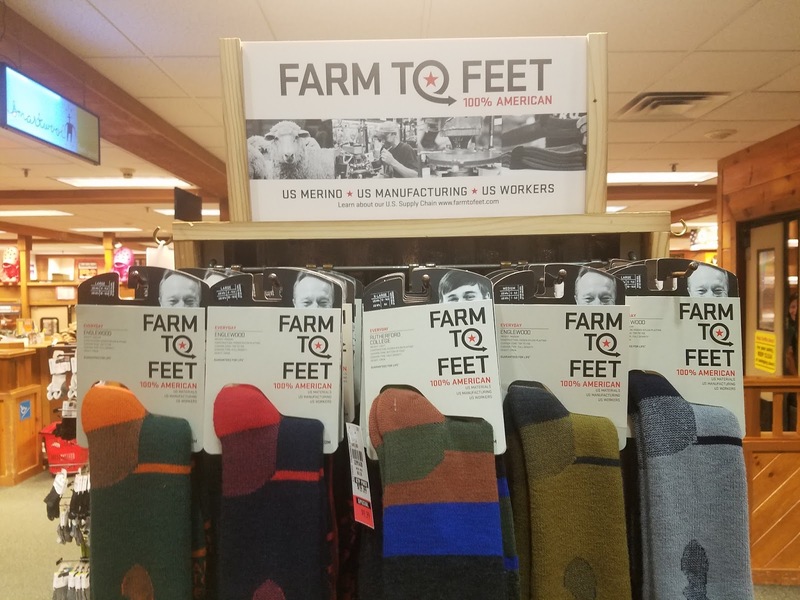 Someday, when I am feeling even sassier than usual, I could offer options for our grand leader's deeply unpatriotic merchandise. I have so much good stuff coming and so many good ideas from 2 weeks of thinking and unplugging a little. Stay tuned!